My oldest son is a Boy Scout. He's working toward his Eagle Award, the highest award in Boy Scouting. One of the Eagle requirements is to earn the Emergency Preparedness merit badge. The other day, AKD asked me to help him work through a home safety checklist, which is one of the things he needs to do to earn the Emergency Preparedness badge. Stairs/halls are kept free from boxes, toys, brooms, tools, etc. No. Just...no. However much I beg, plead, wheedle, and cajole the children to put their toys away, it just doesn't happen consistently. Disinfectants & cleaning products are out of reach of children. Um...and how are they supposed to use them if they're out of reach? What happened to all those merit badges and pins where the boys were supposed to do chores around the house? Spilled grease, water, or bits of food are wiped up immediately. Well, sometimes. But the truth is, most of the spills in our household are child-initiated. They don't even report their spills most of the time, let alone clean them up. See: Stealth Vomit. Before bedtime, furniture placement is checked for orderliness. Alright, sometimes, I will make sure that there is a path from the bed to the door through the debris, or from the door to the bathroom. Does that count? Wax on floors is thoroughly buffed. Come on, people. You really think we have time to wax? Housework clothing has no drooping sleeves, sashes, or frills. Shoes worn for housework have low heels. Um...I'm supposed to have special housework clothing and shoes? How could I have gotten this far in life not knowing this? Everything has a place and is in its place. And therein lies the problem, my friends. Everything is most certainly not in its place at any given moment. How could it be? We live here. And while I do have that handy-dandy mess-seeing power, there are four of them and only one of me. My putting-away-ing is not able to keep pace with the pulling-out-losing-interest-and-leaving-it-where-it-lies-ing (which I have to admit, I do a fair amount of, myself). I can laugh about it now, but as AKD was reading down the list, with each one of the questions that had to be answered to the negative, my self-esteem took a blow. By the time we were done I was feeling completely inadequate and emotionally drained: like I could do nothing right. These are basic safety requirements. That I am not meeting. Ergo, I am failing my family. It's a wonder we're not all in the emergency room right now. This happens every time I try to measure up against some outside standard. Every time. I look around and everyone is so much better at just about everything than I am. And they have nicer stuff, too. And that's the problem, friends. I shouldn't be looking around, I should be looking up. Up to the One who made me, just the way I am, imperfect on purpose. Up to the One who loves me and redeems me. Up to the One who deems me righteous. God's standard is the only standard by which you or I can be judged. And God has judged me...and you...worthy. so that in [Christ Jesus] we might become the righteousness of God. The lilacs outside my bedroom window are blooming. You know, the ones we didn't even know were there until last spring? Those ones. They're blooming. It's a great reminder to me that just because you don't see something doesn't mean it's not there. Sometimes, in the busy-ness and routine and ordinary, I don't see God at work in my life. The stuff and things of life block my view, and after a while I forget to look beyond the clutter and noise to the God of everything. And I forget that God is there. But like the lilacs, hidden from view by weeds and junk trees for years, just because I don't see God, don't feel God, don't hear God, does not mean that God is not present. Anyway, this mission is not from God. The nice folks over at Smiley360.com sent me two full sized bottles of new AVEENO Active Naturals Nourish+Dandruff Control to try--I chose 2-in-1 shampoo and conditioner and conditioner, but you can also get shampoo. Wasn't that nice of them? And now, my mission, which I already chose to accept, is to tell y'all about it. Keep reading for my thoughts and a $3 printable coupon below. So I should tell you, I do not have dandruff. I do have experience with dandruff shampoos--my husband used them for years, and I tried a couple of different varieties to deal with cradle cap with a couple of my kiddos. And I do have an itchy scalp. Ugh! So annoying. See, the problem with traditional dandruff shampoos is they tend to dry out your scalp, which, in turn, contributes to the dandruff issue, as well as making your scalp itchy. The big deal with new AVEENO Active Naturals Nourish+Dandruff Control is that it combines an anti-dandruff ingredient with Active Naturals oat complex to soothe dry itchy scalp and infuse moisture into hair. So, you don't have to choose! Isn't that great? The scent is pleasant, and not at all overpowering, and it's nice and thick. My scalp was instantly soothed when I applied these products. But the very best part is how soft and manageable my hair looks and feels. But, does it work, you ask? Well, like I said, I don't have dandruff, and we don't even have anyone suffering from cradle cap right now, so I can't speak to that, but I will tell you that my itchies have been greatly reduced, and my hair is so soft and under control, even. And believe me when I tell you, good hair days are few and far between around here due to my thick, long (because who has time to get a haircut), and very curly hair. Since I've been using these products, I've had more good hair days than bad...so I'm sold. I found AVEENO Active Naturals Nourish+Dandruff Control at Target, for around $5 for a 10.5 oz bottle, but you can get it at Walmart or drugstores as well. And, if you'd like to save a little money while battling your dandruff and/or itchy dry scalp, click here for a $3 off coupon. Thank you to Smiley360.com for providing these full-sized bottles of product for me to try, free of charge, for the purposes of this review. All opinions are my own. It snuck up on me: this perfect storm of busy-ness and chaos that is twirling and swirling around me, tearing at the edges of my sanity. My mantra when it comes to laundry? "At least it's clean." I call it Mount. Bluefield, and I'm diligently waiting for it to put itself away. Somehow, I don't think this is what Jesus meant when he said if we just have faith we can tell mountains to move and they will. Nah, it's not that bad. It's just...that time of year. The end of the school year "stuff" is ramping up, spring sports have started, and I still have all of my other household and family responsibilities. It all leaves me exhausted, wondering, at the end of the day, what just happened. You see, it's a delicate balance we've developed over here, and if we add one thing, maybe even two, we're OK. But when you start adding eleventy-million field trips (why did they have to wait until now? ), plus 6 sports practices/games a week (and that's only 2 children--what was I thinking, having 3? ), a travelling husband, and all of the "fun" end of year school stuff, like kite day and the talent show and lumberjack breakfast and picnics and who knows what else they're going to throw at us...it's all we can do to keep moving forward. And sometimes? In this storm we call life, with the wind whipping and the rain pouring? Progress is measured not by forward movement, but simply by not falling down. Are you with me, friends? One day at a time, one foot in front of the other. Leaning into the storm. Standing. And...not completely unrelated...here's how my s'more cupcakes turned out. Sounds like everybody loved 'em. Last night on the news they were talking about birds crashing into windows and dying. Apparently, this is a huge problem in Minnesota. They showed this woman from the Audubon Society who has this upright freezer just full of birds who met their fate at the hands of window glass. Have y'all seen the design for the new Vikings stadium? It's pretty much one big window (I think it's gorgeous, and would love to see a game there, but I'm afraid I won't be able to afford it), and that has the bird people upset. Because birds are stupid (no offense, birds). And that means birds are going to die. They're all in a tizzy about it. In fact, Vikings officials are meeting with the Audubon society later this week. To talk solutions. Me? I have the solution. I don't know when the last time a bird crashed into our windows was. And do you want to know why? I don't do windows. It's as simple as that. All those stadium people need to do is put smudges and fingerprints all over the stadium glass. You're welcome, people of Minnesota. Thank you to CityPages for the stadium images. Isn't it lovely? Tomorrow, I'm responsible for bringing a dessert to MC's year end Cub Scout campout. This is the celebration of all of the boys' accomplishments this past year, plus their advancement ceremony. And an excellent opportunity to get filthy, at which the boys all excel at taking of advantage. I originally thought it would be fun to bring a s'more cake. You know, a cake that looks like a giant s'more? But then I realized that individual servings would be more practical than a cake that someone has to cut and serve, so I started looking around for s'more cupcakes on Pinterest (where else?). Don't they look yummy? Well, if you're a person who likes marshmallow, I mean. But as I was looking, I came across several recipes for s'more cake pops, and, being informed that Hubby was afraid there would not be enough dessert for the campout, I decided to make them, too. Only easier. My friends, I give you: s'mores on a stick. wooden skewers, marshmallows, chocolate for dipping, and crushed graham crackers. roll in graham cracker crumbs until coated (unrecognized file format strikes again...so no pics, but trust me--it's easy). Lay on wax paper for chocolate to harden. That's it. YUM! I mean, if you're a person who likes marshmallows. My 10 oz bag of marshmallows yielded 12 s'more pops. But then because I had extra chocolate and graham cracker crumbs and an open bag of marshmallows in the cupboard, I made some doubles and singles. 'Cause, you know, why not? And then I did this. Because, you know, presentation is everything. Well, I don't really know if that title up there is true--with this crazy weather we've been having, who knows when planting time is or was or will be? Two weeks ago, we had 6 inches of snow on the ground. Yesterday, our temp reached 95. I think mother nature must be experiencing hormonal fluctuations. But despite the uncertainty, urged on by my little helper, I planted about half the garden space this morning. We planted sugar snap peas, pumpkins, zucchini, and pickling cucumbers before my helper lost interest, and then I planted more cucumbers and zucchini, spinach, carrots, radishes, and a few sunflowers. Sounds like a lot, doesn't it? I'm really not sure how we ended up with so much to plant--probably a result of shopping while hungry--never a good idea. I probably planted everything too close together, especially considering how those pumpkins like to take over the place. I guess we'll just see what comes up, right? I am particularly hopeful that the spinach will do well. Yum! I'm planning to plant several tomato plants in the flower beds in front of the house again this year--since the flower beds receive more sun than our garden, they did really well there last year. Hopefully we'll get enough to can again this year (and/or friends will give us their excess garden produce for us to can). I also discovered a packet of mixed annual flower seeds in our stash, so maybe this weekend I'll go out and turn over the back half of our little garden space and sow those there. I'm coming across more and more recipes that I'd like to try calling for fresh herbs, and I'd like to grow some, but I'm not sure where yet. Perhaps in pots on the back porch, so they'll be proximate to the kitchen. Not a whole lot of sun back there, though. And that's it! What are you planting this year? I loooove dessert. There is a problem with dessert, however, and that is, if dessert is available, I will eat it. All. Of it. So although I love dessert, and I love making desserts, I rarely do make them--usually just for birthdays and when we have company to help us eat them. That's why I jumped at the chance to bring a dessert for the teacher appreciation luncheon at my kids' school this morning. The other problem with dessert, or specifically with making dessert, is it's so hard to decide what to make. So many good choices out there. So I put it to my Facebook friends. The contenders? Candy Apple Cheesecake, Fruit Pizza, or Caramel Almond Poke Cake. After the voting opened, I decided red velvet apple cake pops would also be a fine choice, but not wanting to confuse the constituency, I did not put that one out there. 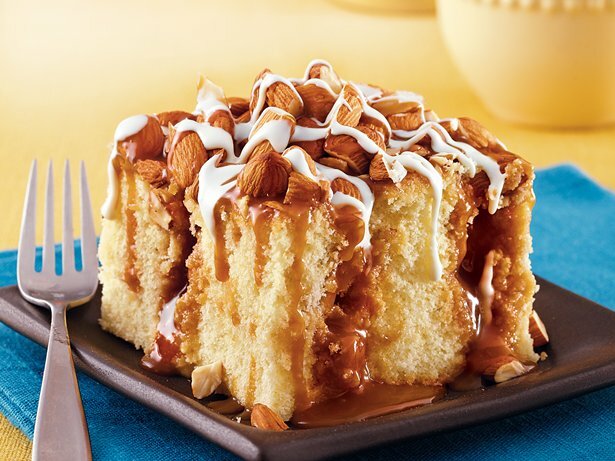 The winner was this ooey gooey Caramel Almond Poke Cake from Betty Crocker. Mmmm... It looks so yum, doesn't it? And, to tell the truth, this is the recipe I wanted to win. That's not what I made, however. I made mini fruit pizzas. Why, you ask? Because one of my voters just happened to be one of the to-be-appreciated, and as such, her vote was worth 100,000. She voted for fruit pizza. Bake the cookies according to your recipe and allow to cool. For the frosting/sauce beat 8 oz of cream cheese or neufchatel until creamy, adding 1/4 c granulated sugar, if desired. Then fold in an 8 oz container of cool whip. Place the cream cheese mixture in a zipper-lock bag, snip off a corner, and pipe the frosting on to the cookies. Top with diced fresh and/or canned fruit. I used blueberries, strawberries, kiwi, and peaches. Grapes, raspberries, pineapple, and mandarin oranges would also be good. Note to self: next time you buy patio furniture, get the kind without cushions. I am not a very confident driver. I tend to go slow in snow, especially around curves like in our driveway, and although I have tried, I cannot for the life of me back-up our driveway (in other words, if I get stuck in the driveway, I really am struck until a better backer-upper happens along. Or the snow melts. You know, whichever comes first). Hubby took the 4WD vehicle today. All of which leads me to believe that I will not be able to get out of my driveway with my vehicle unless I shovel. And even though I have nowhere to go (until 4:30), I do like knowing that I could go somewhere if I wanted. And that was a nice side tangent, wasn't it? Oh, why wasn't I snowblowing, you ask? Well, my friends, this snow is too wet for the snowblower. AKD tried, but didn't even get a full swath done before the chute clogged. Bummer. So, shoveling it was. Well, OK, I was shoveling. The kids were around the side of the house, where the pool is, being awfully quiet for a snow day. I just went with it, because, you know, shoveling is my zen (by the way, our faithful friend is still with us). Oh, maybe that should have been one of my bullet points up there: shoveling is zen. And as a mommy to 3 boys, I don't get a whole lot of quiet. Anyway, turns out the boys were trying to rescue a frog that was clinging to some icebergs in the pool. His throat was all puffed up to make his own personal floatation device, and he was hanging on for dear life. Frogs are cold-blooded, remember, so with the water temp at right around 32 degrees, there wasn't a whole lot more he could do than that. He must have thawed out from his frog-cicle hibernation when we hit 70s and 80s (just two days ago!) and then he was stuck when the weather turned cold again. My boys, they have a special place in their hearts for frogs and toads (remember this? And this? We're going back there this summer), and if I'm being completely honest, so do I. I have many fond memories of catching tadpoles and frogs and attempting to keep them as pets. We just had to rescue the poor little guy. And yes, I let them bring him inside to warm up. They're already plotting ways to get me to let them keep him. Oye.